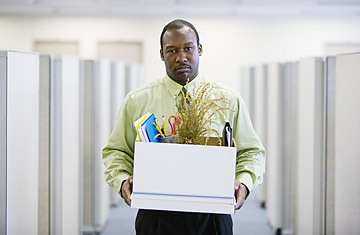 Employment consultant Martha Finney doesn't pull any punches when she talks about layoffs. "The very first thing we should all do is just cop to the fact that it could be us," she says. "If we're drawing a paycheck, we could be losing that paycheck. Period." Her new book, Rebound: A Proven Plan for Starting Over After Job Loss (FT Press) is intended for those who are nervous about their job security or find themselves on the unemployment line. With 3.6 million jobs lost since the recession began in December 2007, that's a lot of people. TIME senior reporter Andrea Sachs reached Finney at her office in Santa Fe, N.M.
What if someone tells you that you're being let go? What do you do and say at that awful moment? What if you burst into tears? I think that's completely normal and natural. I think if you're dealing with a humane terminating manager and a humane HR person, their hearts are breaking too. It's just painful all around. Is it O.K. to express that you think the layoff is unfair, if you think it really shouldn't have been you? Is there any point in writing down what's been said to you? Absolutely. In fact, even if what is being said to you seems innocuous, if you take that document to an attorney who looks it over and knows what he's looking for, there could be something buried in that document that can give you leverage for a more substantial severance package or even a wrongful-termination suit. It's going to give you bargaining leverage, ultimately. And again, never sign the severance agreement right then and there. It's ridiculous that it takes you much longer to buy a car than it does to lose your job. Nobody ever expects anybody on a reasonable basis to sign any document under duress. It's completely realistic, reasonable to expect to take that document home or a copy of it so that you can look at it with your spouse, look at it with your attorney. There are all sorts of things embedded in a severance package that you can negotiate to your favor, even if it means negotiating an extra month of health insurance. Who do your files belong to? Are you allowed to take them? No. Your files are company property. If you have extra time, if they give you a couple of weeks to tidy up business, you can probably use your contact list, because those are relationships that you carry with you, to let people know that you're leaving. You can set the tone for why you're leaving without making you sound vindictive. But in terms of company property and documents and company secrets, those belong to the company, and you should leave them alone. See pictures of office cubicles around the world. Read about how our emotions can get us out of the recession.